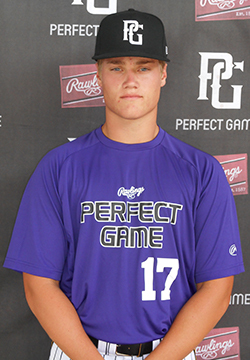 Gavin Younce is a 2019 C/1B, 3B with a 6-0 180 lb. frame from Chesapeake, VA who attends Greenbrier Christian Academy. Recorded a 7.67 second 60-yard dash time. Athletic frame with well-proportioned current strength and room for physical projection. Primary catcher with clean and effective footwork. Quick arm while throwing downhill and has an element of explosion. Arm path is a bit long but gets good carry on throws and explosiveness of actions allow for quick transfers; recorded an impressive pop time of 1.91 seconds. High level catch and throw skills. Secondary infielder with fluid actions and quality arm strength. Has good glove talent with carry on throws. Fields the ball well and cleanly out in front. Righthanded hitter with a wide base and starts closed. High hand set with high back elbow and is looking to leverage the swing hard to the pull side. Looseness to hands with good bat speed. Stays on plane well with consistent hard hit contact. Controls the barrel of the bat well and repeats the swing. Named to the 2017 Atlantic Coast Underclass Showcase Top Prospect List. Outstanding student.